I first introduced you to RJ Charms in April (you can read about the shop here), and readers were struck not only with the fabulous variety in RJ's shop, but the fact that she offers FREE shipping to the U.S. and Canada. Combine that the low prices, and you've got yourself a match made in heaven! RJ is offering a $20 Gift Certificate for a shopping spree to one Serenity Now reader, and she's also giving away a discount code to everyone!! Between now and Sunday, November 21, you can get a 10% Discount over at RJ Charms by using the code: serenity. With RJ's free shipping policy, you can score some great deals on Christmas gifts. 1. Visit RJ Charms and leave me a comment here with the name of your favorite item. 3. Facebook this Giveaway with a link to this post. 4. Link up an old or new Thanksgiving-related post to the ongoing Thanksgiving Round-Up! Giveaway open until 10 pm on Sunday, November 21st. *Note: No Weekend Bloggy Reading party tomorrow. I'll be participating in Melissa's Favorite Things party over at 320 Sycamore. I have several pieces of RJ Charms jewelry and love each and every one of them! I think if I won this giveaway I would buy the peas in a pod necklace. So cute! I also love the seasonal winter jewelry. Thanks for the chance to win! I like the acorn necklace! 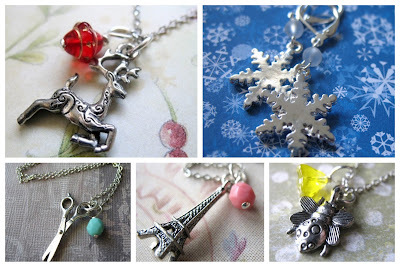 Love the Let it Snow Snowflake necklace and that camper charm is adorable! I love the Eiffel Tower, but I would have to pick the bee. Hubby's grandmother's name is "B" and she collects bees. Her birthday is next week and she would love this! Love the camera charm. My best friend is a photographer and this would be the PERFECT gift for her!! I love the Princess charm, a perfect gift for a little princess! I love the Let It Snow Shimmery Snowflake Charm Necklace! How perfect for the holiday's! I like the Fleur de Lis! I love the Olivine vintage rhinestone necklace. My grandmother's middle name was Olivine, so this necklace would always remind me of her. Chez Paris and London Calling are my favorites. . . but then, Paris and London are two of my favorite cities! Hope you're having a great week!! I love the Hey Cupcake Necklace. Too cute! Thanks, Amanda! oh, I love all of it. I've had the Chubby Starfish on my list forever. But I also love the opalite, the doe a deer, ... so many things. The Chez Paris - Eiffel Tower Charm Necklace is so adorable! my favourite is the stand-mixer for the baker in all of us... sigh - I think it's so cute. plus I heart Nicole - the charm making diva - she's not only my cousin (in-law) but awesomely talented! I love the Ginko Leaf Charm! Sunday Shopping Showcase: Christmas Cards! My "First" Thanksgiving and a Recipe Round-Up!